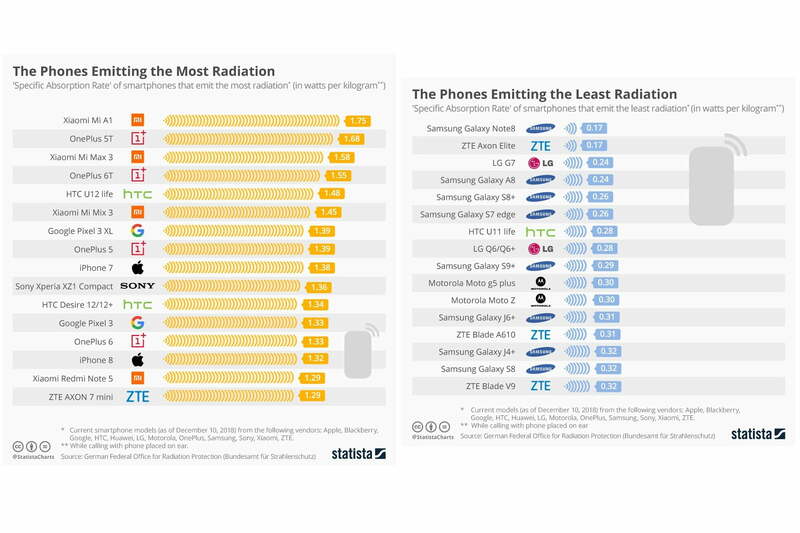 The compilation of radiation emissions, which was transformed into easier-to-read graphics by Statista for smartphones with the most radiation and least radiation, took note of each device’s specific absorption rate, or SAR. The value quantifies the amount of radiofrequency waves that each smartphone emits, with higher numbers increasing the chances that users are exposed to harmful radiation. Xiaomi and OnePlus were the worst offenders in terms of cellphone radiation, with the two smartphone companies taking four spots each in the top 16. The Xiaomi Mi A1 recorded the highest SAR at 1.75, followed by the OnePlus 5T at 1.68, the Xiamo Mi Max 3 at 1.58, the OnePlus 6T at 1.55, and the HTC U12 Life at 1.48. Other popular devices at the top of the list include the Google Pixel 3 XL and the Google Pixel 3, at the 7th and 12th spots, respectively, and the iPhone 7 in 9th place. Meanwhile, on the other end of the spectrum, Samsung was the top manufacturer for smartphones with low amounts of radiation, taking eights spots in the bottom 16. The Samsung Galaxy Note 8 and the ZTE Axon Elite were found to have the lowest SAR at 0.17, followed by the LG G7 and Samsung Galaxy A8 at 0.24, and the Samsung Galaxy S8+ and Samsung Galaxy S7 edge at 0.26. So, what do these SAR numbers mean? Unfortunately, there is still no universal guideline that sets a “safe” level for cellphone radiation. The German certification for environmental friendliness, named Blue Angel, was given as an example, only certifying smartphones with SAR of less than 0.60. There have been various studies that claim cellphone radiation is harmful to humans, potentially causing cancer, and there appear to be the same number of studies that debunk that claim. According to the initial findings of a $25 million study by the National Toxicology Program, radiation from smartphones does indeed cause cancer, but a pair of government studies said that the amount of radiation coming from smartphones will only be harmful to rats, and not to humans.